Ono's Trading Company, makers of polarized sunglasses with magnifying bifocals, has introduced two new lightweight, rimless titanium frames - Latitude and Schooner. Latitude, with gray, and Schooner, with amber polycarbonate lenses, feature nonslip, adjustable silicone nose pads and hingeless temples that allow the sunglasses to conform to most faces. 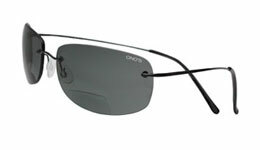 Ono's coats both sides of its lenses to resist fogging and repel rain, sunscreen, perspiration and dirt; the lenses also protect against UVA and UVB exposure. Order sunglasses with 1.50-, 2.00- or 2.50-power magnifiers. Retail cost is $149.99. Call 866-865-4695 or visit www.onostradingcompany.com.